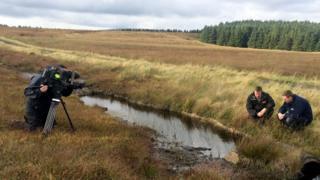 A five-year conservation project is set to preserve hundreds of acres of bog and improve habitats for birds and butterflies in Northern Ireland. The EU-funded project will see work done in three protected areas of counties Antrim and Fermanagh. They are the Garron Plateau and Montiaghs Moss in County Antrim and the Pettigo Plateau in Fermanagh. Garron is one of the best examples of blanket bog anywhere on the island of Ireland. Work will start in January to block drains that will help restore and manage the area. It is hoped that the measure, along with controlled grazing, will improve habitats for species like hen harriers, curlews and cuckoos. Plants such as marsh saxifrage and Irish lady's-tresses orchids should also prosper. Northern Ireland Water owns and manages the site and said it is hoped the conservation work will improve the quality of raw water it takes from the area. RSPB NI is the lead partner in the project, the biggest it has ever undertaken. As well as Northern Ireland, projects in Scotland and the Republic of Ireland will also benefit. In total, more than 2,000 hectares of bog will be improved. Director Joanne Sherwood said it was "key European funding for what is a vital conservation project". More than £4m is being provided under the EU's INTERREG VA programme, managed by the EU's special programme body. The authorities in the three countries will provide additional money. Butterfly Conservation will work with landowners at a number of the sites to improve the conditions for the marsh fritillary butterfly which is in decline.